Summer means more play time and less screen time. It means more family time and less running around. The kids are out of school having all the time in the world to learn and create. Summer can also mean hearing “I’m bored” more times than you can count. 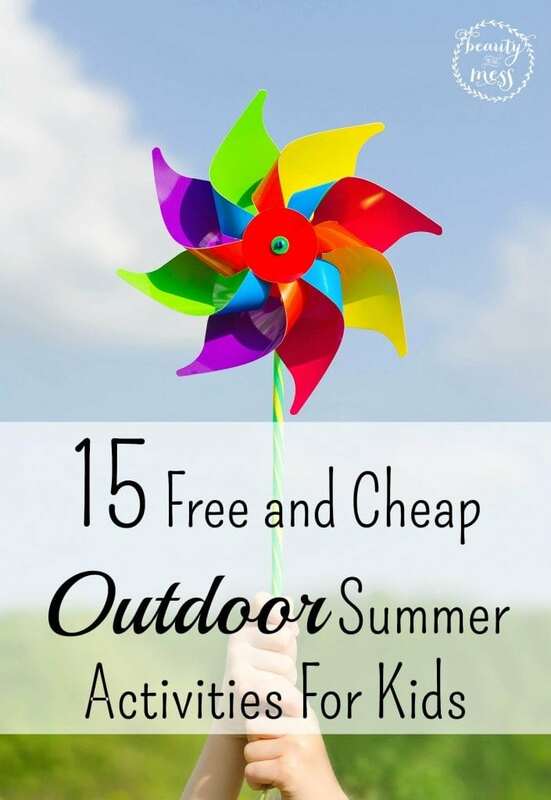 Here are some free and cheap Summer activities for kids to help beat the boredom this Summer. Tour de Parks. There are several parks in our area and even two in our neighborhood. The kids and I decided that once a week we would go to a different park in the area. Sometimes meeting friends and sometimes just us. Occasionally, Daddy even gets to tag along! The kids have loved this! They can run out their energy, meet new friends, and I get to enjoy making memories with them. When we stay at home, I get so caught up in my never-ending to-do list. I have a hard time breaking away to enjoy those little moments. But when we’re at the park, it’s just us. No phone, no to-do list. We can simply enjoy being together. Sidewalk Chalk. My kids love to pull out the sidewalk chalk. Sometimes they get carried away and it turns into wall chalk and door chalk, but it usually washes off. Unless they use the pink chalk. Then we just enjoy their art for awhile. I usually draw a hopscotch board on the ground and they hop from square to square. They don’t quite understand the concept of throwing the stone into the square and jumping over that one, but that’s okay. They are having fun. Bubbles. My absolute favorite bubbles are the ones from Gymboree. But they aren’t cheap. I usually blow the Gymboree bubbles and let the kids pop them. When fill up the bubble blower that the kids use, I put in the bubble solution from the Dollar Store. They love playing with the bubbles and they are working their face muscles and lip placement. This is an excellent activity for my son with Apraxia. Baby Pool or a good ol’ fashioned sprinkler. Our neighborhood has a pool, but we have yet to use it. I just can’t bring myself to take three little ones to the pool by myself. That just sounds like a recipe for disaster. But we do have a deflatable pool that is the perfect size for the kids and a little splash pool for the baby. We have tried the sprinkler in the past but for some reason they were scared of it. The sprinkler is way better for our yard though. We may or may not have left the pool out full of water and now have a big brown spot in our backyard. Oops! I also bring out plastic pitchers, cups, bowls, scoops, and anything else they can pour and mix water in. Splashpad. I had never heard of splashpad before having children. It’s great! We just dress the kids in their swimsuits and swim shoes and they run, I mean walk of course, around the splash area. We have two free splash areas around us and two about 45 minutes that you do have to pay for but it’s not expensive. Music in the Park. We absolutely love that our local Symphony has free performances during the Summer. We recently attended a performance overing looking a lake. It was a beautiful night for a performance. We sat off to the side and the kids were able to run around and dance to the music while not disrupting the other patrons. My daughter is still talking about it, asking about the next performance. Picnic at a Park or in your own backyard. We usually have backyard picnics for lunch. It’s a nice change of pace for all of us, and I don’t have to clean up the crumbs. Sometimes we call it a tea party and make everything little. Little sandwiches, small snacks, we drink out of the tea cups from their play tea set. They love it! Let your children create an obstacle course with items found around your house. We haven’t done this one yet, but it’s on our Summer Bucket List. The only rules are the items have to come from the house and the kids make up the rules (within reason of course and safety). This could be done indoors on a rainy day, or outdoors and include a cool splash in the water. The possibilities are endless! Local Pool. Even if your neighborhood doesn’t have a pool, most cities and towns have public pools. There is a cost, but it’s usually not a lot. Depending on the age of your children or grandchildren, they could even join the swim team. Farmers Market. We love the farmers market. It’s a great place to meet the farmers, get to know them, hear their story, and know where your food comes from. While you’re there, ask the farmers about farm tours, or if they ever open their farm to visitors. Visit a local Farm. We recently bought chicken from a local farmer. We went to the farm after processing day to pick them up. My children loved the farm. The chickens running around, the bees buzzing around the bee boxes, the garden growing, and the fresh air. They loved it! Some farmers offer classes for preschoolers and children that are geared to their level. Usually all you have to do is ask at the Farmers Market! Visit the Zoo. There are a couple of petting zoo type places around us and two Zoos within hours. These aren’t free or cheap, but sometimes you can find coupons in the Entertainment Books that are sold as fundraisers. Go on a Nature Walk. Earlier this week we went on a nature walk in our backyard and found a caterpillar! Right now she’s (yes, “she” is a girl, lol) in a mason jar with dirt, leaves, and a stick. My daughter talks about her “pet” like she’s a member of the family. She is very concerned about her and what she is doing. We are also learning about what caterpillars eat and how to identify what kind of caterpillar she we now have. Now every day it is requested that we go on a nature walk to see what else we can find. I dread the day we find a snake and they ask to bring it home. That answer will definitely be no. Play in the rain. Obviously use common sense and do not go out in the rain if it is storming, or lightning. But a nice Summer rain is perfect. If your children have rain boots and rain coats, great! If not, expect some really wet kids. Dig in the dirt. My kids have always liked to dig. I’m not sure what the fascination is, but they love it. We won’t talk about how they sometimes eat the dirt too, because that’s just gross. We have a raised bed in the backyard where I wanted to plant our garden but instead our herbs just took over. There are two places in our small backyard I know I can find my kids if I ever look out and don’t see them right away. They are either playing hopsquatch (not to be confused with hopscotch) on the stepping stones or digging in the dirt in the raised bed. They may also be eating mint leaves or fennel at the raised bed. They love it. I hope that you are now ready to beat the boredom as you face the rest of the Summer with your children! What are some free or cheap activities that you would like to add to this list? Please share! Looking for activities to beat the heat? Check out these great ideas for indoor Summer fun from Beauty Through Imperfection.